Few midsize sedans can compete with the world-class Toyota Camry and with a recent redesign, the Toyota fan favorite is more attractive than ever. With the introduction of the 2019 Toyota Camry, many car shoppers want to know – what's new for the Toyota Camry? Find the right fit at Downeast Toyota with this 2019 Toyota Camry vs 2018 Toyota Camry comparison. No matter which Toyota Camry model year you choose, you will have a choice of five standard trim levels – L, LE, SE, XSE and XLE – that feature an affordable price tag. To make the 2019 Toyota Camry SE even more attractive, engineers have added a Nightshade Edition that creates a one-of-a-kind style with black 18-inch wheels, a black rear spoiler, black exterior accents and much more. What Are the Differences Between the 2019 Toyota Camry and 2018 Toyota Camry? A complete redesign made the 2018 Toyota Camry a true automotive masterpiece and the 2019 Toyota Camry has built on that world-class foundation. Learn more about what sets Toyota Camry model years apart in this 2019 Toyota Camry vs 2018 Toyota Camry comparison. With the addition of Apple CarPlay technology and Amazon Alexa capabilities, the 2019 Toyota Camry will keep families connected no matter where your next adventure may take you. Under the hood, the Toyota Camry plays host to an arsenal of engine options that provide the perfect combination of power and fuel economy. Entry-level Toyota Camry trim levels come standard with a 206-horsepower 2.5-liter Dynamic Force four-cylinder engine that pairs with an eight-speed Direct Shift automatic transmission to earn 29 mpg in the city and 41 mpg on the highway. Toyota Camry XLE and Camry XSE entries upgrade performance with an available 301-horsepower 3.5-liter V-6 power core that will achieve 22 mpg in the city and 33 mpg on the highway. 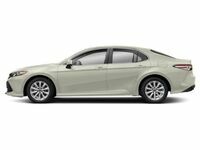 Toyota Camry midsize sedans make room for five passengers in a spacious cabin that provides 100.4 cubic feet of passenger space. 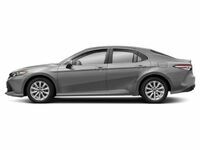 When you add 15.1 cubic feet of trunk space, the Toyota Camry is perfect for day-to-day errands and neighborhood carpools. Highlights of the Toyota Camry spec sheet include a 7-inch Toyota Entune™ 3.0 touchscreen infotainment system that comes complete with Scout GPS® Link capabilities, Entune™ App Suite, an optional JBL® sound system and onboard Wi-Fi capabilities. Safety is at a premium in any family sedan and it starts with Toyota Safety Sense™, which features a Pre-Collision System with Pedestrian Detection, Lane Departure Alert with Steering Assist, Automatic High Beams and Dynamic Radar Cruise Control. 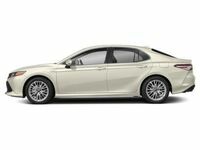 Find the Toyota Camry that is the best fit today at Downeast Toyota!